Here's some tips I've picked up over the years. 1) Get a bike fit. It'll help you be more comfortable and therefore allow you to ride faster, farther and possibly even in a more aerodynamic position. 2) Work on your flexibility and drop your stem/handlebars to get more aero. 3) Raise your stem/handelbars to get more aero. Hey wait - how can that be true if it goes against #2? Well many people aren't flexible enough to take advantage of their race bike fit. By raising the handlebars they're able to actually ride the drops sometimes and therefore be more aero than always having to be on the hoods. 4)Bend your elbows while riding on the hoods or drops. 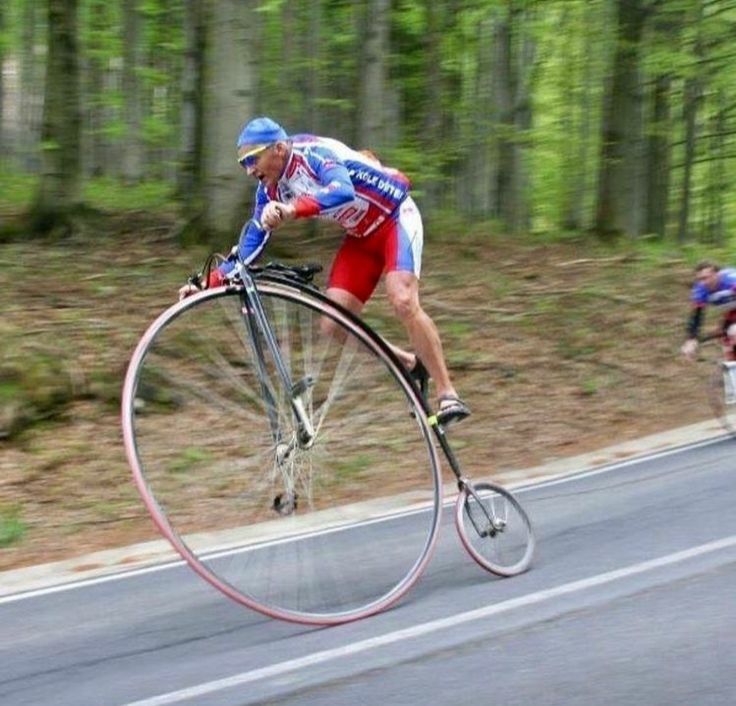 This will make you more aero and therefore faster. It takes time and practice to be able to do this for very long without getting tired or sore. 5)Throw your bike on a transit train and watch the road fly by! 6)Pump your tires up. It'll reduce the drag on the pavement and allow you to go faster. 7)Lower your tire pressure. Research shows that lower tire pressures can actually be faster especially when riding on a rough road. Whether #6 or #7 is right for you may require a bit of research and/or experimentation on your part but don't assume higher pressure is always faster. 8)Use 25C tires instead of 23C tires. It'll allow you to run lower tire pressure and therefore be more comfortable while it also reduces rolling resistance. 9)Draft behind a friend or in a group. 10)Start your ride well hydrated. Dehydration can drastically reduce your performance on a bicycle. 11)Bring some food while on rides longer than one hour. 12)Use a sports drink or something with sugar and electrolytes if you're on rides longer than 90 minutes. 13)Wear tighter fitting clothing. Many people work so hard to get fit, spend crazy amounts of money on their bike and wheels and then wear loose fitting jersey, jacket and other clothing that eats up precious watts in reduced aerodynamics. This is one of the best ways to get faster without getting fitter. 14)Lose some weight. This one is especially true if you're going up hill. 15)Put some new cable housings and inner cables on your bike. Having nice smooth shifting may not make a huge difference in your speed but it just may make you that little bit faster to catch the wheel of your buddy who just tried to break from the group. 16)Don't overgrease your bearings. Research has shown that most people put too much grease in their wheels when regreasing them. This increase resistance and actually slows you down. Take your wheel apart, clean everything then just put in enough grease to keep everything from getting dry. 19)Shave your arms. Research has shown that this will make you a little bit more aero and therefore faster. I don't know of anyone who has done this but the wind tunnel studies show it works. 21)Have some caffeine just before and/or during a ride. If you're not a regular caffeine drinker then you'll get a benefit from this. 3mg per kg is a recommended amount. Maybe try this in stages in case the caffeine messes with your body more than expected. 22)Draft a car. No wait - this could get your killed, injured or fined. Probably not a good idea unless you are behind a coach who has taught you how to do this. 23)Take some weight out of your seat bag. This is more effective for uphills. 24)Reduce the amount of water you have in your water bottle cage. Less weight means faster - especially up hill. 25)Go on a day that's not too hot or too cold. 26)Wear cycling aero overbooties. These have a considerable benefit especially when riding at faster speeds. 27)Drop the nose of your seat 1-2 degrees. Being more comfortable may just make you faster. It may also help your night life if you know what I mean. 28)Clean your chain and drive train. Less dirt and grease on your chain will mean less friction and more of your power will get to your rear wheel. 29)Spend your retirement on a more aero bike, wheels and equipment. 30)Use add on triathlon bars for your road bike. Just don't do this while riding on a group ride as you could cause a serious accident. 31)Learn how to ride with your forearms on your handlebars and hands in the aero position. Note: This is extremely dangerous and is best left to the pros. I'm no pro and have learned how to do it but be forewarned that it can be extremely dangerous!! 32)Adjust your tires to the exact right pressure before every ride. Most people don't check the pressure every ride and are therefore giving up a bit of speed and/or comfort. 33)Clean your brake pads and rebuild your brake calipers. Wait - how can that make me faster? Well the faster and better your brakes are the later you can leave the braking when you enter corners. In other words you can go faster for longer. It'll also help your descending by increasing your confidence. 34)Use a power meter. By holding a steady or consistent level of power you can go faster without wasting energy. You can also use a power meter to go a little bit harder up hills and a bit easier down hills because this has been shown to be a more efficient and faster way to cover more ground. 35)Use a heart rate monitor. By learning your differnt heart rate zones you can be smarter about how to use the fitness you already have. 37)Use better tires. Most bike manufacters cheap out on the tires and this is an easy upgrade to make. Higher quality tires grip the road better and allow you to corner and ride with much more confidence. Apparently some tires actually have lower rolling resistance as well but I don't think this makes all that much of a difference. 38)Take the winter trainer tires off your bike and swap them out for a high quality set of race tires. Heavy tires are usually slower tires. 39)Go tubeless! Tubeless tires are usually lighter and more supple. Both allow you to ride at higher speeds and can also make your ride more comfortable. 40)Get your bike serviced. Having your bike work like a new one may not give you a lot of extra speed but walking your bike on the side of the road because it wasn't serviced is certainly not very fast. 41) Practice your descending aero position. Be careful with this one and find a safe place to try it after talking to an expert about it. 42)Use positive self talk while riding. I used to ride Hawk Hill in SF a ton. Among my friend group the golden time to get to the top was under 9 minutes. I've done the ride with probably 50+ friends, I only have 4 that have done it in sub 9 minutes. These are generally fit dudes. I lost 30 pounds riding my bike starting in 2014 - 2016. On my 282nd ride up Hawk I beat my best time by over 30 seconds. I ate a burger the night before and didn't sleep well (due to the salty burger). what changed for me? I stopped riding 6 times a week. I started doing high intensity interval training boot camps running sprints and adding muscle. I started those classes in April 2016, by September 2016 I broke my hawk hill record, with almost no planned training to beat that time, it just happened. This is me on the morning it happened.